Southern Airlines (not to be confused with the much larger Southern Airways which became Republic Airlines in 1979) operated weekday commuter flights between Ft. Lauderdale, West Palm Beach, Melbourne, Titusville, Daytona, Gainesville, Jacksonville, Tallahassee, and Panama City, Florida in 1981. The airline was essentially a re-branding of troubled Florida Commuter Airlines which had suffered a fatal crash in the Bahamas the previous September. Southern Airlines was formed in early 1981 and officially acquired Florida Commuter Airlines and its two aircraft, one DC-3 and one Piper Navajo, on May 31st, 1981. Southern presumably went out of business in the autumn of that year as it was listed in the September 1, 1981 issue of the Official Airline Guide but did not appear in the December 1, 1981 issue. 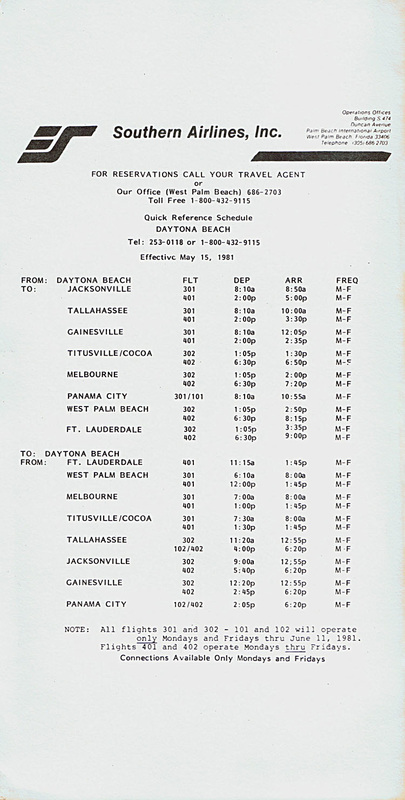 Below: Southern Airlines quick reference schedule for Daytona Beach effective May 15, 1981. Thanks to Arthur Na for this incredibly rare timetable.